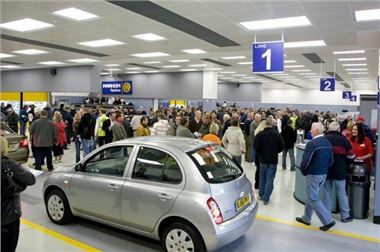 The latest edition of Manheim Auctions’ monthly Market Analysis for cars will show that in April 2009 average values rose by just 1% compared with March. This rise in average value by £68 to £6,762 is the fourth month in a row that an increase has been reported following increases of 11.6% in January, 10.5% in February and 6.4% in March. In the Fleet sector average values rose by 2.1% (£125) to £6,163 while in the Dealer sector average values increased by just £1 to £1,939 and in the Manufacturer sector they fell by £4 to £11,937. Within the individual vehicle segments examples of increases in average values include Compact Executive and MPV models in the Fleet sector which rose by 5.0% (£407) to £8,487 and by 13.3% (£723) to £6,154 respectively. Within the Dealer sector Small Hatchbacks increased by 1.0% (£19) to £1,883 and Large Family vehicles by 7.2% (£99) to £1,464. In the Manufacturer sector the 4x4 segment rose by 18.3% (£2,694) to £17,364 but as both average age and mileage fell significantly, this increase doesn’t necessarily represent an underlying improvement in value for 4x4s. Examples of decreases in average values include Small Hatchbacks in the Fleet sector which fell by 4.2% (£190) to £4,348 and Medium Family vehicles in the Dealer sector which fell by 0.5% (£10) to £1,829.